Dipping your bread in Extra Virgin Olive Oil seems to be a very American invention. In Italy, you'll never see anyone doing that and while restaurants are probably accustomed to tourists asking for olive oil for their bread, they are probably laughing at you in the back. As this article in the Huffington Post can attest. Italians instead eat a much healthier alternative, pinimonio, which is simply raw, fresh vegetables dipped in extra virgin olive oil. 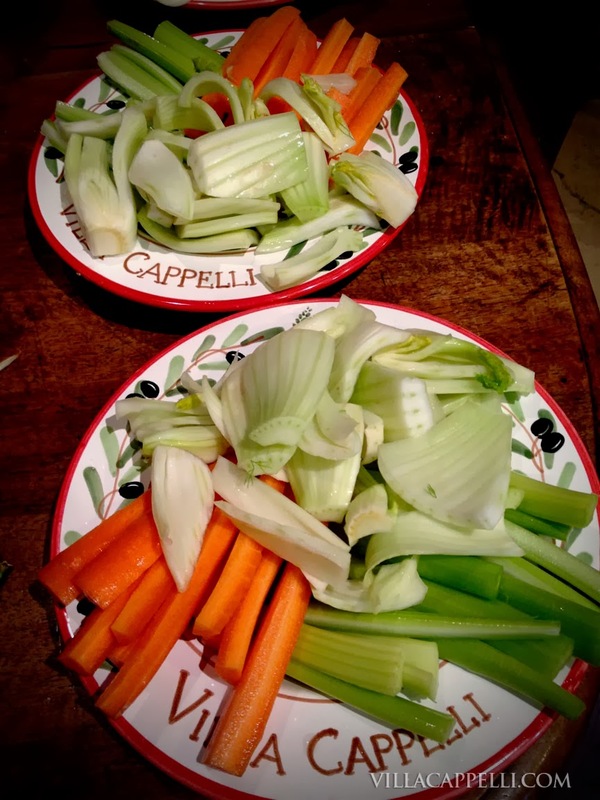 Vegetables ready for their dip. There really is no set "recipe." Just prepare a big plate of fresh vegetables cut into strips or pieces for dipping. Feel free to use whatever you like, but bell peppers, cauliflower, broccoli, fennel, celery and carrots work well. Then serve with Villa Cappelli Extra Virgin Olive Oil. Have some red whine vinegar and our 100% Italian Sea Salt on hand if anyone wants to add a little extra flare to their dish, but our oil has enough flavor on it's own. Everyone can make their own small dipping bowl to taste or make a big one everyone can share. Then just dip and eat. Oh, and our flavored oils are perfect for this as well, especially the Sun-Dried Tomato Oil, which is almost sweet with a hint of sun-dried tomatoes, garlic and mint infused into it.